When it was completed, the 1915 Equitable Building had the largest total floor area in the world. Although it could never claim the title as the world’s tallest building, the skyscraper was nevertheless a behemoth that eclipsed the sun and cast a shadow onto its neighbors. Many New Yorkers feared that the carte blanche held by developers would create a city in which sunlight was a luxury, plunging residents into a macabre world of darkness. The time for intervention was ripe, and the government stepped up to the plate with a novel idea–the first comprehensive zoning resolution in the country. The 1915 Equitable Building. Image via Wikimedia Commons. The 1916 New York City Zoning Resolution imposed height and setback limits and distinguished between residential and industrial districts. Its purpose was clear – to prevent buildings at the scale of the Equitable Building – but figuring out how to implement the resolution was a different story. Architects began navigating how to master the resolution, and with it, usher in a new era in New York City building. 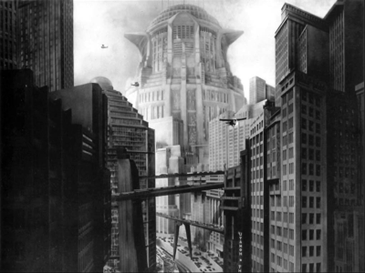 A scene from Metropolis. Image via Wikimedia Commons. Ferriss’ drawings were produced in an age when architecture was synonymous with vision. Radical social changes resulting from the industrial age led to the belief that if an architect could dream it, it could be built. A lack of imagination was the only impediment to outdoing one’s rivals and the skyline of New York City was reshaped with such vision. In the end, many of the buildings based on Ferriss’ drawings were never realized. They epitomized a grand vision of New York City that was not firmly codified. As the priorities of urban planners changed, it only became a matter of time before the city’s zoning regulations would be given a fresh start. In 1961, New York City reformed its zoning code, doing away with the archaic 1916 regulations. Many of the 1916 Zoning Resolution’s underlying planning principles had failed the test of time since they did not allow for the city to grow sustainably. The 1961 code attempted to remedy this problem by encouraging privately owned public spaces and was based on floor area ratio instead of setbacks. Zoning now served not only to ease the density of the city, but also to better integrate buildings and their individual environments. This revision serves as the basis for how the New York City Department of City Planning oversees the zoning process today. The New York City Department of City Planning stresses the importance of sustainability in its description of how the present zoning code works. While zoning laws originally focused on skyscrapers and individual buildings, today, the regulations attempt to comprehensively address a myriad of urban planning issues from affordable housing, to promoting fresh food stores in underserved areas, to requiring bicycle parking in some buildings. Each zoning law has left a distinctive mark on the city. From the Daily News Building to the Chrysler Building to the Empire State Building, the 1916 zoning laws demonstrated, with help from the ingenuity of Hugh Ferriss, that buildings should be cognizant of the space around them. Building including the Ford Foundation, built following the 1961 changes to the zoning code, prove the viability of integrating buildings into their environments. Today’s zoning laws attempt to make the city more than the sum of its parts. As urban planners and architects, it is important to remember that zoning laws are not set in stone. Based on the changes over the past hundred years, one can only wonder what the future may bring. Presented below, are more drawings by the talented Hugh Ferriss. They portray an alternate future of whose existence we can only dream. This is a great read and the drawings are awesome except for one where it looks like a man is getting reamed by the Chrysler Building.? Whats up! I just want to give an enormous thumbs up for the great information you have here on this post. I shall be coming again to your weblog for extra soon.